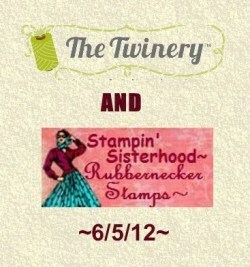 I am so excited that the Stampin' Sisterhood is having a combined blog hop with The Twinery! If you arrived from my talented friend, Carolyn King's blog, you're in the right place! For my creation, I had so much fun making my Christmas card using The Twinery's beautiful twine in Peapod, Lemondrop, and Maraschino (don't you love those yummy names?) and Rubbernecker's cute Santa and tree images. Both images were stamped with Memento Tuxedo Black ink and colored with Copic markers. I added liquid applique to Santa's facial hair, and Fun Fluff to the fur on his coat hem, cuffs, and stocking cap. As you can see, I applied the Peapod green twine to this funky Christmas tree image, as well as the outermost framed section. I used the Lemonade twine for my punched star on top of the tree, and I sewed the Maraschino twine for the "Joy" sentiment banner that Santa is holding up. I wrapped the Maraschino twine around the inner framed section. My notched corner punch is the perfect tool for looping the twine around the two framed areas. ***There will be two winners - one from The Twinery and one from Rubbernecker Stamps. --The Twinery will be giving away the "I Dream in Color" Sampler Pack, a retail value of $32. 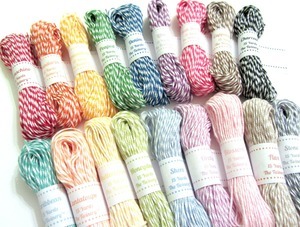 Here's a photo of all the beautiful colors of twine in this prize package. ***You must leave a comment to win on every blog of both The Twinery design team and the Stampin' Sisterhood design team in order to be eligible for the prizes. ***Remember to leave a comment at each stop for your chances of winning! Deadline for leaving comments will be 11:59 PM EDT, Friday, June 8. Your next stop on the hop route is Angelica Suarez! Charlene, that tree is FABULOUS! Thanks for playing along with The Twinery! Awesome framing and tree Charlene! So clever! Look at you getting a jump on christmas cards! what a fun use of twine on your jolly Christmas card Charlene! love the squiggle tree!! Darling idea for the tree...super cute, and yes I do love the names of the Twines!! Adore how you featured The Twinery twine! You are so clever, my friend! I love your design so much! OMG, what fab use of the twine! WOWZER! Super cute card! Love the way you used the twine. A very cute Christmas card. I like how you used the twine on the Christams tree. Love your card. Super cute! So very clever and creative, Charlene. I love this card. This is soooo cute, Charlene...the twine tree is a genius idea and what a darling little Santa!!!! Oh my goodness, what a clever idea. I absolutely love that twine tree!!!! Adorable. so fun to be hopping with YOU! Miss you! LOVE your fantastic card and how you clever-ly incorporated the twine! Fantastic! How fun is this card?! Love all the twine accents! Wow! Look at your go with the twine. You've really taken this card to another level. Nicely done! Very creative way to use baker's twine! I love it! That twine tree is my favorite part....so cute! Wonderful use of the twine! Now there is a unique idea for twine!! Love the tree! What a fabulous card and layout. Such a sweet Christmas card. Love the way you've notched the corners to add twine "frames" - great idea! This is just ABSOLUTELY ADORABLE!!! I love the bright colors and the layout and how you incorporated the twine! First Christmas card I've seen with the twinery used, very cute! Great card! Wish you could make mine! This is adorable, Charlene! I love all of the texture on Santa and the twine tree is perfect! Adorable card! Love the tree!! Think I might have to steal this one -- definitely going on Pinterest! Very cute way to use the twine with these images. I am getting such great ideas from this blog hop! I love what u did with the Christmas tree. Love the way you have used the twine! Its Great! This card looks gorgeous! I like how you used the twine ... I too LOVE to play with twine:) Thanks for your inspiration! Your Christmas card is a great treat for the eyes. Love your tree. no wonder you had such fun doing this..tis too cute! Charlene, "funky" is def. the word for that adorable card. Love it! Love your style. I'm your newest follower. Looking forward to checkin' out your blog some more! I am always ready for Christmas card making! This is so cute, like a candy cane card :) Nice work. OH MY!!! I LOVE the use of twine on this. What a phenomenal idea!!! AWESOME card, Charlene. A show stopper, really. Love the way you use the twine with the stamps! Very cute x-mas card! Great card !! I love your christmas tree !! TFS. Best use of the twine yet! Love the tree! That tree is to die for! Sooooo cute! Love this card--the stamps and the twine make it pop! that is just the most adorable christmas tree I have ever seen! The twine adds the perfect touch! Great card!! LOVE the twine tree! Oh Charlene! Your card is so creative - I love how you used your twine with your stamps!! !